Here, in question-and-answer form, is the second part of a special report by internationally famed Swedish biochemist, manufacturer and lecturer, Eric Eweson. IN THE previous issue Mr. Eweson revealed that in the last fifty years — and notably in the New World — there have been greater demands on the land than the land can give without losing its natural fertility. This situation cannot be remedied by chemical — or commercial — fertilizers, as we call them, which are being used so extensively in modern times to increase the yield from the soil. Mr. Eweson revealed that the theory of chemical fertilizers was born of war. It was conceived Jin Germany during the latter part of the nineteenth century by a gentleman whose name was Baron Justus yon Liebig. He developed his theory by analyzing organic matter and noticing the predominance of nitrogen, phosphorus, and potash. He then conceived the idea of adding those major elements to soil in the form of water-soluble chemicals to increase production. The idea seemed to work like magic and was gradually adopted all over the world. But one important fact was overlooked! Science has found that even if we add to the soil these chemicals which are the ones used in the largest quantities by plant life, we still use up the organic living portion of the soil. And the greater the quantity of chemical fertilizer that we apply, the faster is the organic, living portion used up! As the organic matter diminishes, we must increase the quantity of chemicals to obtain the same yields — not to mention the loss of quality. Gradually we will arrive at the point when there isn't enough of the humus fertility left in the soil to sustain a crop, NO MATTER HOW MUCH CHEMICAL FERTILIZER WE APPLY. In common terms, the soil is then said to have "died." Now for questions and answers about the soil and your health. The following questions were asked Mr. Eweson at the conclusion of his lecture, which was delivered at Ambassador College in Pasadena, California. QUESTION: "What effect do chemical poisons have on the soil? In this nation chemical poisons are used on many crops to kill boll weevils, codling moths, and many other crop-destroying insects. What effect does this have upon the microbes in the soil? ANSWER: It has a toxic effect on all life in soil. In soil it is not only the soil microbes that are desirable, but you have an enormous number of beneficial insects. Often some preparatory work has to be done by such insects, after which the microbes appear and finish up the job. By using pesticides and poisons of various kinds to combat weeds, pests and parasites, you will always have a poisonous residue that will become incorporated with the soil. Such residues are invariably harmful to soil life, and can have even worse effects than chemical fertilizers. QUESTION: "You mentioned that insecticides have been applied to plants and gone into the soil, and their effect on the soil. What relationship, does good soil have in reduction of diseases and pest infestations in orchards and fields? In other words, what can be done in the soil itself to reduce pests and diseases in plants without harming the soil?" ANSWER: My idea would be to improve the fertility of the soil. Pests and parasites have always existed, but they were never as dominant as they are today on our exhausted soils. We have now had modern pesticides for some 20 years. Yet pests and parasites have never been nearly as much of a problem in agriculture as they are today. For some 4,000 and more years humanity managed very well without pesticides. All this proves that with fertile soil, pests and parasites are not a serious problem. Remember also that we NEED pests and parasites, because their purpose is to destroy the weak and the unfit. That is a basic organic principle. Without such natural censorship the species would not improve but would degenerate. A weak plant is one that should be prevented from reproducing itself. Note how many of the pests and disease organisms go right to the seed. Take the corn borer or the larva that destroys the seed of apples, and pears. This has the aspect of a natural law, which is difficult to prove only because we don't yet know enough! We know that when we use more and more pesticides the pests develop greater and greater immunity. Mosquitoes and flies become immune to DDT in, a season or two. So we have to use bigger and bigger doses and stronger and stronger poisons to control the pests, and yet we have more than we've ever had before. This is a serious dilemma and a big problem. I don't say that we can be absolutely sure about fertile soil being the complete cure, but take agriculture in the times of your father or grandfather. Farmers then certainly didn't have much problem with pests and parasites. I know my father didn't. They could not have made a living by their old methods if they had had our insect problems. We actually know very little about the hundreds of different pests and parasites that bother us. After all, just because we have names for them doesn't mean that we know much about them. Today it seems the average American farmer spends more money and time on pesticides than he does on anything else. Take tobacco, for instance, which they must spray three to four times a Week, and if it should rain, they must immediately spray again in order to replace what washed off into the soil. These are the instructions given by the Department of Agriculture! QUESTION: "What is the extent of damage that is done to the soil bacteria by commercial fertilizers? ANSWER: I can tell you that only in general terms. Water-soluble chemicals, like nitrates, phosphates and potash, are all toxic. They are so toxic to plants and to microbes that if you apply too much both the plants and the microbes die. You and I would die too if we should consume even a very moderate dose. Water-soluble chemicals, of course, do not remain in the soil, as they would soon leach out They are, therefore, used in much larger quantities than the plants can absorb. By using the chemicals moderately you can, however, minimize the toxic effects but you can't AVOID the fact that plants and soil microbes are still affected as to metabolism and cell structure! Wheat, for instance, used to average 16% protein. Today our wheat averages no more than 12% protein. While such a drop of ¼ may not appear too serious, we don't know what all it entails. We do know that it is the protein that carries the trace minerals, the enzymes, the vitamins. That 4% difference may well mean difference between a good wheat and a very deficient wheat. Farmers today know that they have to feed much larger quantities of grains than they had to in times past. QUESTION: "Much has been said in the last few years about 'trace minerals.' Has study revealed just what the functions of these minerals are?" ANSWER: That is more than I can answer, and in defense I may say that nobody quite knows. We are discovering new angles continuously. Until some ten years ago nobody thought that boron, manganese, or molybdenum were very important nutrient elements, but now we have found that they are absolutely essential. Copper, zinc, fluorine, iodine — all of them are necessary for some purpose, and in some cases we know why. At least we know what happens if they are unavailable to plants, animals and humans. QUESTION: "Why is it that farmers often have to buy seed even for open-pollinated corn, instead of using their own seed year after year?" ANSWER: Because their own corn, being grown on a chemical diet, does not germinate properly. The same occurred in respect to tomatoes that were grown by hydroponics. In other words, tomatoes were grown on a new kind of food — chemicals. But they were not accustomed to it — and it is doubtful that they could ever be — so they would not produce germinating Seeds to perpetuate themselves. It is the same with our grains being grown largely with nitrates, phosphates, and potash chemicals. They were not made to grow on a diet composed mainly of those three chemicals! Such a diet induces plans malnutrition. This causes disturbances, one of which is that seed loses germinating strength. The same occurs to yeast grown with chemical nutrients. QUESTION: "When you say to let the soil rest, what do you mean?" ANSWER: To rest the soil you generally grow some kind of a cover crop on later to be plowed in to increase the organic content of the soil. Of course, you can also put the land in pasture, which will also improve it to some degree. In some European countries like Holland and Denmark, where modern intensive agriculture had an early start, they soon found that the soil began to deteriorate. Then chemical fertilizers came into use to increase yield's, which confused the situation for about fifty years. Today in Europe most people are aware of the need to use the municipal wastes for the land, and it is now being done more and more extensively. But very few are as yet making real compost by modern methods. In fact I know of only two countries where it is done, in Spain and Norway, and those factories were built by me. Others are merely 'grinding up the wastes and segregating glass and other foreign matter for salvage. The ground organic matter is put on the land and plowed in for decomposition in the soil while the land rests. That can be done if the soil still has some humus fertility left. But if such raw organic matter is applied to soil that is too poor in microbial life then, of course, the organic matter fails to readily decompose and become humus. Using raw un-decomposed organic wastes on the soil is far from the-proper way, but is much better than our chemical ways! QUESTION: "What is the American Medical Association's approach to this problem of soil health?" ANSWER: The great majority of the Medical Association are not as yet aware or concerned about it, but there is a very active minority group of physicians which is keenly awake to the situation. QUESTION: "Would you recommend any particular books on the principles of conservation?" ANSWER: The last ten years have seen a great deal of new literature in this field. There is especially one man who has written very clearly on the subject, yet not in too scientific terms. His name is Leonard Wickenden. He has written several very readable books. We have, of course, also the Englishman, Sir Albert Howard. He was really the father of this new concept of natural agriculture. He died only a few years ago. He was one of my teachers at one time. He did most of his work in India, and was the originator of the so-called "Indore Method" for making compost on farms; not industrially, which is my great interest. In our society we must, to survive, use our city wastes in order to solve, not only our soil problem, but also our desperate air and water pollution problems. For this we need a method that meets modern demands for sanitation, results in no objectionable odors and requires a minimum of manual labor. You can't get manual labor in our society for making compost of our municipal wastes by primitive, ill-smelling methods. But done by modern industrial technique it is just as clean an operation as making yeast or operating a dairy. The materials are processed in closed fomenters into which sewage would be piped. Garbage and other refuse is also handled largely by machines. The high temperatures developed during the process of fermenting is an absolute guarantee against the survival of any microbes harmful to man or beast. We have proven that it can be done and that the end product is a most effective fertilizer. There remains the need for vision and a will to pioneer. QUESTION: "Would this plant do away with city dumps and garbage dumps where they just burn the garbage?" ANSWER: Of course, and not only for garbage, but for most of the trash, too. In Los Angeles the refuse contains about 50 to 60% paper. Paper is an organic product, it comes from the soil and the cellulose decomposes the same as cabbage leaves and celery, etc. There is thus no objection to the paper. In trash you have also other things — metal rags, etc., which should be salvaged. Rags of wool or cotton will, of course, decompose, but not nylon because the microbes are very particular in not wanting anything synthetic. QUESTION: "In converting these industrial by-products into organic fertilizers, how would you eliminate some of the very poisonous materials that we find in by-products?" ANSWER: That is a very interesting question. Waste products from most food processing plants, breweries, canning factories, flour mills, packing houses, etc. — they offer no problem. But then you have, for instance, chemical factories that produce pesticides. When those pesticides are defective, they are sometimes thrown into sewers. That is bad for the sewage and for our process. But sooner or later that has to be taken care of in some way anyway, because such pollution of our water supply is terribly destructive. The growing use of detergents in American households is already now making the sewage treatment process more difficult to operate. Not yet so that it doesn't function, but if it should continue to increase, there will have to be some new rules. There is already now a considerable check on industry not to dump certain materials into the sewer. Such poisons as DDT, a very serious poison which is now almost everywhere present, is actually broken down by the microbial activities in the fermentation process if you do not have enough DDT to kill all the microbes. If not present in great quantities, it is broken down in fertile soil in the same way, but you must have GOOD fertile soil with an abundance of microbes to do it. Good soil can eventually recuperate from the abuse rendered by small amounts of DDT. All of such poisons are not broken down, though. QUESTION: "In the sewage fermentation process, what is the danger, or lack of danger, of passing on diseases through use of human waste in this process?" ANSWER: That is a very good question to bring up. Here again, natural laws are shown at their very best. In a proper composting process, the microbe's themselves develop a temperature as high as 160 to 180° F. Now there are no pathogens — disease producing organisms — that can stand more than about 125° F. for more than a few seconds. So there is absolutely no danger of harmful bacteria surviving in compost. Even if you aerate the process that I am describing with cold air, the microbes will raise the temperature to 160° F. and more. So natural laws are provided to guarantee ample safety. Now as far as such life as nematodes is concerned, which under certain circumstances can survive high temperatures, we still don't need to worry. They are devoured by those busy little soil microbes. They love nematodes! In my experiments with com-post over the last 20 years, I must have had cuts on my hands hundreds of times. I have deliberately never taken any precautions, and I have never had any infection! Soil is a great cleanser! Soil is where disease has to end! The Tetani microbes, for example, do not exist in fertile soil. But you could get Tetanus from a wound, caused by falling on a street or on a gravel road, especially if animal excrement is around. QUESTION: "Mr. Eweson, I understand that you have built some units to convert sewage to compost in different countries. Would you explain how that works and how long it takes to convert that into compost?" ANSWER: The fermentation cycle is from five to seven days, but can probably be brought down to four days. This means that sewage and garbage after only four days is converted into concentrated soil fertility. You can hardly distinguish it from very rich topsoil. The process is simple and works very well. You don't expect me to say anything else! As a matter of fact, the county of Los Angeles has built an experimental plant to test my system, and they have only recently stopped these experiments, stating that they are satisfied that the process is practical on a large scale. So someday you may see it here too. QUESTION: "In your process for use of municipal by-products, how do you handle the volume of contaminated water that would go to the plant along with the sewage?" ANSWER: For my composting process we cannot use the highly diluted sewage water directly from the sewers. Excess water has to be eliminated by conventional types of sewage treatment plants, although they can be very simplified. We can use the sludge residue with anywhere from 10 to 40% dry content. But the remaining sewage water which still holds from ½ % to 1% solids can also be fermented by a supplementary fermentation process. We can no longer afford to pollute our water supply with sewage. This is a problem that has to be solved very soon. 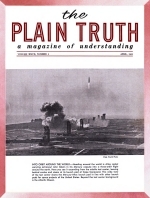 I was very impressed today to see in the August issue of your PLAIN TRUTH magazine an excellent article on this very subject. It is high time that somebody does something about it. QUESTION: "You mentioned growing some of the crops out here on California desert lands. When we bring water into a desert area, for a short time it seems as though the land is fabulously rich and then it loses productivity. Is that due to possibly just a very minimum portion of vegetable matter being in the soil? Is this desert land particularly rich in minerals so that it offsets the lack of humus for a short time?" ANSWER: I shall try to explain that. It is true that this particular soil is rich in minerals that plants can utilize. The minerals are still there largely because there is very little rain to leach them out. With such land you can make good crops on a minimum of good organic matter. After the plants have used up those available mineral nutrients and as there is very little organic matter left in the soil, these nutrients cannot be replenished. There is, you see, a lack of humus and soil life to break down and decompose the rock material! It is the activity of the microbes in the soil that constantly liberates all of the mineral nutrients needed for healthy plant growth. If you take the average agricultural soil in the United States, you will have from two to ten thousand pounds of phosphorus per acre, twenty to thirty thousand of potassium per acre in the top six inches — and much greater quantities in the subsoil. All other mineral plant nutrients will be found in relatively equal abundance. However, they are not in compounds that the plants can utilize. If you fertilize such land with good organic fertilizers which stimulate microbial activities, then these enormous quantities of nutrients will gradually be released for utilization by the plants. QUESTION: "I have practiced the use of compost pits several times in the past on a small farm. You made mention of introducing some type of soil microbe to start a compost pit. I now have one that has so far been made with soil and wet leaves. Apparently there aren't enough microbes in the soil to institute the action. How do you begin it?" ANSWER: You are beginning an inquiry into the intricacies of the corn-posting art. The first thing I would like to say is this: If in this compost pile you have only leaves and soil, you don't have a very good base. Good compost is preferably made from various kinds of organic raw materials. Everything needs variety in its diet. I wouldn't say it is lack of inoculation, but rather the uniformity of your raw material that creates difficulties for you. There have been some elaborate investigations made at the University of Southern California on the subject of inoculation for good production of compost. The conclusion after three years of experiments was that normal compost piles, made from garbage, for instance, need no special inoculation since garbage contains a great variety of organic matter. Soil microbes are everywhere present and if conditions are favorable they will grow in numbers enormously fast so that the proper microbial flora will soon develop. Naturally, if you have good compost available and mix that with your new compost materials, then you would have a very effective inoculation and a faster process. In your case the poor result is obtained because you have mainly leaves. Leaves have the tendency of matting, which prevents access of the air and subsequent good inoculation. This fermentation that we are now talking about in the making of compost is an aerobic form of decomposition for which air is always necessary. Otherwise you will have a putrefactive, or anaerobic (airless), development with bad odors because the microbial requirements for oxygen will be obtained by reduction. In soil you should never have putrefaction but only aerobic decomposition which gives no bad, odors. QUESTION: "How much effect does the amount of organic materials in the soil have on the retention of water in the soil?" ANSWER: It has a great effect. I would say that organic; matter is so porous it can hold at least its own volume in water, and if you have 10% good organic matter in soil, you will increase this soil's water-holding capacity by something like 100%. With good soil, a 4-inch rain would cause little or no runoff. Even ½ inch of rain on poor land will cause erosion and will flood lower areas. The fine inorganic matter seals up the pores so that little or no water enters the soil. By impoverishing our soil, we thus also lose the ability of the soil to hold and conserve moisture. Instead of building dams to hold back rivers, it would be much better to plant trees and improve the soil of the surrounding land. Naturally this isn't always practical, but dams aren't always practical either because, if the land is poor, dams will soon silt up and become ineffective. There again, by violating natural laws, we create all kinds of disturbances and we don't know where it's going to end. Some effects of soil abuse we have touched on tonight, but there are many more, in fact, enough to write whole books about. QUESTION: "Do earthworms produce fertility in the soil over and beyond what the rotting organic material would produce itself?" ANSWER: Yes. Earthworms are one of those "little animals" that belong to good soil and do a terrific job in decomposing both organic matter and dirt! Darwin calculated that one worm puts through him or herself a quantity of soil that is almost unbelievable. Soil that has passed through the intestinal process of a worm has improved tremendously in quantities of plant-available potassium and phosphate. It has also been shown, and again I think it was by Darwin, that a good acre of land contains several tons of worms. Their work is also very important for aeration of the soil by means of their extensive burrowing. I have conducted experiments in many countries, and it is amazing to see how quickly the earthworm population increases with soil improvements. You wonder where they come from. I have experimented with soil in Spain where I could not find any worms. By improving it, it was teeming with them two years later. Earthworms are undoubtedly "little friends" that are very beneficial to the soil. A fertile acre of land has also millions of insects of various kinds, all of which are doing their jobs. Some are devouring parasites, others are preparing organic material for subsequent decomposition by bacteria. All of them also fertilize the soil with their wastes and dead bodies. I thank you very much, ladies and gentlemen. It has been a pleasure to be with you. And we wish to thank Mr. Eweson for consenting to have this material available for all who read The PLAIN TRUTH.